The Central R&D Institute is responsible for product development, including dairy products, beverages, instant noodles, meat, instant food, ice products, snacks, baked food, flour and cooking oil. The Institute works continuously to develop new products and innovate or introduce the related technology to produce numerous innovative and revolutionary products. These products include Ruisui fresh milk, which uses an average of 72℃ low temperature sterilization, Try it! tea, Tea King, returning to sweetness, non-fried noodle series, sterile packet of Manchu dinner and AB Yogurt that helps the drinker's digestive track. Adhering to the spirit of product innovation, the Institute will continue to develop safe and great tasting products. 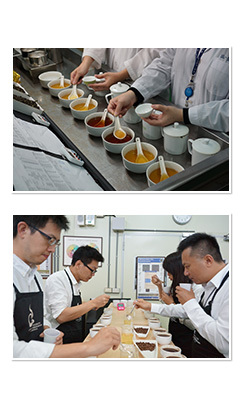 We develop safe and great tasting products that meet the flavor preference in Taiwan by selecting great ingredients and using innovative formula design, stable production process and strict quality control. We also developed over 20 related healthy food products, such as the AB Yogurt, Sugar-Free & Hi-fiber Soymilk, Tea King Japanese Style Green Tea Sugar Free, LP33 Yogurt, and Metamin 3D. These products help improve gastrointestinal functions and help regulate blood lipids, they also make it difficult for the body to form body fat, assist in adjusting allergic constitution, increase immunity and regulate blood sugar functions, etc.